A Michigan high school basketball star collapsed on the court and later died after making a game-winning layup in overtime to cap his team's undefeated season. 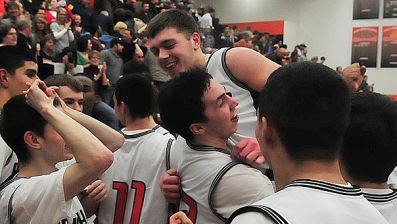 Wes Leonard (center-above photo), of Fennville High, which is roughly 200 miles west of Detroit, died Thursday night, according to Deb Patterson, spokeswoman for Holland Hospital. Patterson said paramedics performed CPR on the 16-year-old before he was pronounced dead at the hospital. The cause of death has not yet been determined. Leonard, a junior, who was also the starting quarterback of the Blackhawks football team, was "by far the best player on that basketball team -- just an outstanding athlete," said coach Mike Miller, whose Bridgman team was defeated by Fennville 57-55 Thursday night. Earlier this season, Leonard passed the 1,000-point mark for his high school career. With less than 30 seconds remaining in Thursday nights game, Leonard hit a layup and Bridgman was unable to score during their ensuing trip down court, giving Fennville the win and a 20-0 season. Afterward, Leonard fell to the ground as teammates and fans rushed onto the court to celebrate the victory. Sadly, he became the second Fennville athlete to die in the last 14 months. Nathaniel Hernandez, 14, died in January of last year after suffering a seizure at home following his participation in a high school wrestling match. On a personal note, speaking as a father of two, I'd like to point out that young athletes need to have more than just a standard sports physical. They need cardiac physicals as well. I urge all parents to keep this in mind and help prevent future tragedies such as the one that took place in Fennville Thursday night. Saw this story on outside the lines. Very sad.